GFXBench results of Intel's upcoming Gen11 GT2 graphics have leaked online and the scores seem to be pretty impressive. The Ice Lake Gen11 GT2 is a significant improvement over Skylake's GT9 and promises 1 TFLOP GPU performance for all. These preliminary scores reveal GT11's advantage over the Vega 10 (and possibly even the Vega 11) and its potential value for OEMs and customers over AMD APUs and NVIDIA MX offerings. The first benchmarks of the Intel Gen 11 iGPU, which is all set to debut with Ice Lake CPUs later this year, have surfaced online and the results seem pretty impressive. Intel's 1 TFLOP push seems to give the Vega 10 and the NVIDIA MX-series a run for their money. Compared to 24 EUs in Skylake, Ice Lake's Gen11 will feature up to 64 EUs and a 4x larger L3 cache. These improvements along with the implementation of a tile-based renderer, Coarse Rate Shading, and improved memory compression give Gen11 a definitive advantage over low-end discrete GPUs for OEMs in building thin and light notebooks. Let us have a look at the initial benchmarks below. When compared to Gen9 (Intel UHD Graphics 620), the new Gen11 Iris Plus Graphics 940 showed excellent gains in almost every GFXBench test except for the Driver Overhead 2 sub-test. We see that on an average, the Gen11 is about 76.53% faster than Gen9 in the GFXBench 5.0 Off Screen tests. Similar performance gains can be gleaned from the GFXBench On Screen results as well wherein the Gen11 offers up to 77.4% faster performance. This is where things get interesting. Considering results from the GFXBench Off Screen scores, Intel's Gen11 seems to have an impressive 63% advantage over the Vega 10 in the AMD Ryzen 7 2700U. The Gen11 posts an unusually high score in one of the Manhattan Off Screen tests. Even if that particular value is omitted, we still see a 45% advantage for the Gen11 over the Vega 10. Gen11's advantage with respect to the Vega 11 in the AMD Ryzen 5 2400G is not that high (~1.7%), but significant nevertheless. The Gen11 manages to come within striking distance of the Vega 11 in almost every Off Screen test and even manages to outperform the latter in a few of them. Again, the Manhattan result is seen to be unusually high. Omitting that particular score gives the Vega 11 a 9% lead. Aside from improvements in 3D performance, Gen11 will also bring DisplayPort 1.4a and VESA's DSC support for 5K 120 Hz output. 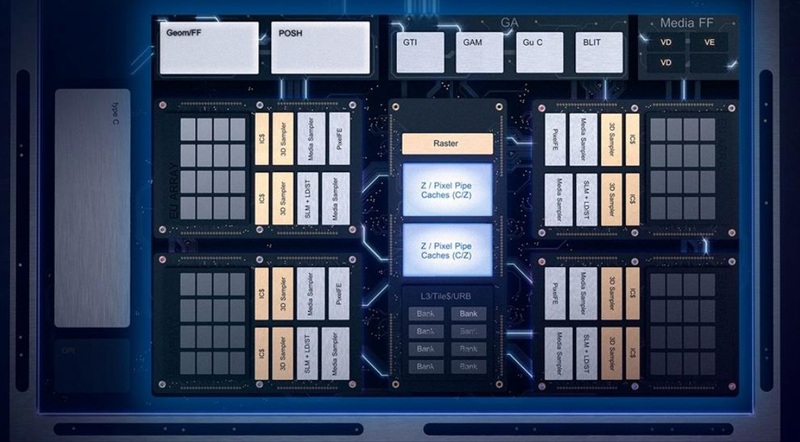 Gen11 will be seen in the upcoming 'Sunny Cove' based Ice Lake CPUs and will be the last generation before Gen12, which will form the basis for Intel's discrete GPU lineup. While synthetic benchmarks scores are good to have, the real performance benefits can only be ascertained in real-world gaming tests. We are still some time away for the Ice Lake launch and these scores are still preliminary, but they underline an important fact that next-gen notebooks and ultrabooks will be able to offer vastly improved integrated Intel graphics performance that can prove to be a viable alternative to AMD APUs and the NVIDIA GeForce MX-series. Intel did get delayed with 10 nm but Gen11 should make the Santa Clara-giant competitive once again.